SAM is comprised of six affiliate organizations each of which are divided regionally within its own organization. The regions provide an opportunity for members to gather on a local level to discuss topics of interest. Click on an organization's name to be taken to it's membership page. Montana Association of School Superintendents(MASS): Members of MASS serve as school superintendents, assistant superintendents, or other central office personnel who hold titles with line staffing equivalent to that of assistant superintendent. Montana Association of Secondary School Principals (MASSP): Members of MASSP are engaged in the administration and supervision of secondary schools or teach courses in education at institutions of advanced learning. Montana Association of Elementary and Middle School Principals (MAEMSP): Members of MAEMSP are employed in professional work related to the elementary and middle level principalship. Montana Association of County School Superintendents (MACSS): MACSS members serve as liaisons between schools, the state and county governments and the taxpayer, as well as administer the small stand-alone elementary school districts. Montana Council of Administrators of Special Education (MCASE): Members of MCASE administer, direct, supervise, and/or coordinate a program, school or class of special education for exceptional children or are members of a college faculty whose major responsibility is the professional preparation of administrators of special education. Montana Educational Technologists Association (META): META members are technologists united into a professional association advocating for and supporting the education of all Montana children. 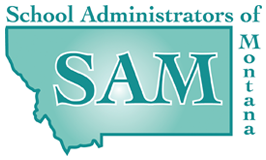 An institutional membership in SAM is available to an institution of higher learning in Montana, to the Office of Public Instruction and organizations whose primary purpose is the support of PreK-12 education. Persons listed under an institutional membership may attend all meetings and serve on committees. An institutional member has the same voting rights as affiliate members except that an institutional member may not vote on any matter regarding resolutions establishing positions on educational issues. Click HERE to access the Institutional Membership application and click here HERE to access the benefits you receive with membership.